TACLOBAN CITY – A reward system was devised by the Department of Social Welfare and Development for the program beneficiaries of the Pantawid Pamilyang Pilipino Program (4Ps). The device called Huwarang Pantawid Pamilya, coursed through the social marketing unit of DSWD, was aimed to empower the program beneficiaries and show the public the progressive impact of the program, create model families who embody strong family ties, demonstrate positive Filipino values and create a positive influence in the community. 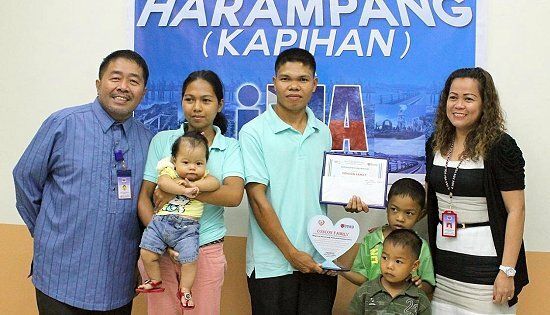 According to Resty Macuto, Assistant Regional Director for Operations, Regional Office 8, the search for “Huwarang Pantawid Pamilya” was geared to acknowledge the good performing family beneficiaries of the Pantawid Pamilyang Pilipino Program. Director Macuto emphasized that the awarding of model families for Pantawid Pamilyang Pilipino Program beneficiaries was timely considering that Proclamation No. 847 was signed by then President Fidel V. Ramos declaring fourth Sunday of September as Family Thanksgiving Day. The search was tedious considering that the criteria is based on desk validation and field validation to really determine the rightful winner. The winning model family was Mr. Jaime Concon and family of MacArthur, Leyte for the regional category who received P6,000 cash plus plaque of recognition. Winners for the provincial category were: Mrs. Nenita Basal and family of Catbalogan, Samar who received P5,000 cash plus plaque of recognition; Mrs. Arlene Narita and family of Naval, Biliran who received P4,000 cash plus plaque of recognition; Mrs. Minda Ypulong and family of San Roque, Northern Samar who received P2,500 cash plus certificate of recognition; and Mrs. Tita Berondo and family of San Juan, Southern Leyte who received P2,500 cash plus certificate of recognition. According to regional winner Jaime Concon, he was hesitant in joining the search considering that since elementary he did not join any contest but he was nominated by the group of beneficiaries to represent them. All winners are parent leaders for Pantawid Pamiliyang Pilipino Program in their respective community. They are anticipating that the program will continue because it really provides help for the indigent Filipinos. TACLOBAN CITY – Some P15.5 million worth of farm machineries were turned over recently by the Department of Agrarian Reform (DAR) to five agrarian reform beneficiary organizations (ARBOs) in Leyte, Samar and Eastern Samar. The amount, according to Regional Director Sheila Enciso, is the total cost of the five tractors given away to ARBOs in severely affected provinces by the super typhoon “Yolanda”. Enciso added that the machines were primarily intended for the clearing and rehabilitation of farm lots in areas greatly affected by the typhoon. Based on available data, Leyte, Eastern Samar and Samar were the hardest hit provinces with thousands of people reported dead, while millions of pesos worth of properties were damaged. Thus, three tractors were distributed in Leyte, while one tractor each for the provinces of Samar and Eastern Samar. DAR entrusted to five ARBOs the operations and maintenance of the machines which cost P3,117,920 per unit. For Leyte, DAR turned over the machines to the St. Benedict’s Association for Sustainable Farming which is based in Tunga, the Boroc Agricultural Primary Multi-Purpose Cooperative in Ormoc and the Zaragosa Agrarian Cooperative in Matalom; while for Eastern Samar and Samar, DAR turned over the machines to the Carapdapan Small Farmers and Fishermen Producers Cooperative based in Salcedo, Eastern Samar and the Legaspi Farmers and Fishermen Association in Marabut, Samar, respectively. 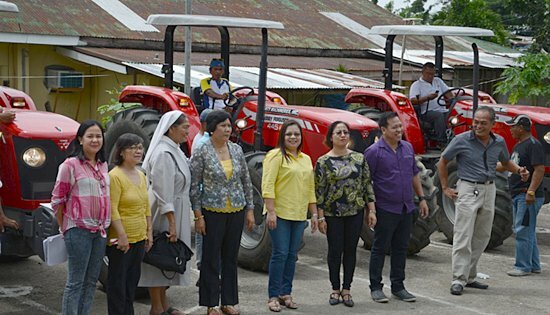 These tractors were funded under the Agrarian Reform Communities Connectivity and Economic Support Services (ARCCESS) project. Though these were not among the recommended common service facilities (CSFs) for the ARCCESS project, Enciso explained that these were provided by the agency in addition for the typhoon-affected areas to help out clear the farms from debris and restore them back to their productive state. It was also very timely, she added, because during the agency’s last meeting with representatives from the Catholic Relief Services (CRS) and the Food and Agriculture Organization (FAO), who both renewed their commitment to assist in the rehabilitation of the ARCs, DAR was asked to provide the tractor to hasten the restoration process. QUEZON CITY – “When injustice becomes law, resistance becomes a duty.” Atty Aaron Pedrosa, SANLAKAS Secretary General borrows a quote from Thomas Jefferson, as various groups and sectoral organizations gathered to launch a movement dubbed as “All Resist Movement” (ARM the People!). Leaders of the Bukluran ng Manggagawang Pilipino (BMP), SANLAKAS, Kongreso ng Pagkakaisa ng Maralita sa Lunsod (KPML), Aniban ng Magsasaka sa Agrikultura (AMA), Pagkakaisa ng Manggagawa sa Transportasyon (PMT) and Partido Lakas ng Masa took turns in lambasting President Noynoy Aquino’s request for a Joint Resolution from Congress that would grant him emergency powers to address a purported energy crisis in 2015. “Why does he need Emergency Powers? The energy crisis is the result of EPIRA, a law that after over ten years of existence has proven to have failed in ensuring power supply and affordable electricity for the people, especially the masses. If Congress should act to resolve the crisis, it is should not be to give Noynoy emergency powers but to throw out EPIRA and pass a new law that gives back the control of the power industry to government.” decried Flora A. Santos of the Metro Manila Vendors Alliance. “Connect the dots. From appropriating the powers of Congress to stop approved government projects, declaring these funds as “savings” in order to divert the funds into other projects, and the cross-border transfer of these funds to allies and prospective allies, his endorsement of ChaCha for the expressed purpose of clipping the powers of the Supreme Court, his innuendos towards term extension, and now, Aquino wants emergency powers. Doesn’t this smack of Marcosian rule?” Pedrosa pointed out. The groups also opposed the Economic ChaCha, spearheaded by House Speaker Sonny Belmonte. Sonny Melencio, PLM Chairman, described the move to insert the phrase “and as provided by law” towards allowing 100% foreign ownership in the Philippines as “an attempt to give foreign corporate interest a free pass to ravage the nation’s natural and human resources without any guarantees that it will benefit the entire populace and not only the factories in export processing zones and the residences of the propertied classes”. While Aquino and his allies give foreign corporate interest carte blanche rights to plunder our economy, PNoy is going on his 4-European Nation 8-day Tour on a Filipino labor-pimping mission.”, added Gie Relova of BMP. “All of the Heads of State and corporate bosses that Aquino will talk to will find out how dirt cheap Filipino labor is and how contractualization has breached all industries in the country and that once the constitution is amended, it will make it even more profitable for capitalists to invest here”, Relova said. The All Resist Movement (ARM the People) which they described as a peoples’ crusade in response to Noynoy Aquino’s plans to further plunder the economy and extend his term in office by amending the constitution and utilizing special provisions that will grant him emergency powers. The ARM the People campaign, as the militants articulated “is also the peoples’ response and resistance to the crude political maneuvers of Aquino and allies to secure their political survival in the 2016 elections by the continued practice of the pork barrel system”. Pedrosa argued that, “After the striking down of the impeachment charges before the House, this call to arms is the logical step forward for an aggrieved and victimized nation to redress the four-year epic failure of the presidency of Aquino and the unabated neglect and misery of our people”. ARM the People will be launched this coming week from the 16th onward with a series of mass actions to bring to Noynoy’s doorstep in Malacanang, to Congress, to the Senate the resistance of a people who will not allow corruption, injustice or tyranny to prevail. On September 21, ARM the People will hold simultaneous protest actions at the grassroots level in various cities and municipalities in Metro Manila, and in major city centers in Laguna, Cavite, Bulacan, Cebu, Iloilo, Bacolod, Tacloban, Davao City and Ozamiz City. CAMP LUKBAN, Catbalogan City – Army troops operating in Leyte Province encountered NPA members in a remote area of Barangay Parag-um, Carigara, Leyte early in the morning of September 14, 2014. Based on the initial report by Lt Col Nedy C Espulgar, Commanding Officer, 19th Infantry Battalion based at Brgy Aguiting, Kananga, Leyte, his troops received information from a concerned citizen regarding the presence of NPA members in the aforesaid barangay who were conducting extortion activities to the local residents. Immediately, Lt Col Espulgar dispatched a squad from Charlie Company to confirm the veracity of the report. However, while approaching said barangay, the government troops were fired upon by undetermined number of NPA members prompting the troops to fire back. A thirty minute firefight ensued after which the rebels immediately withdrew towards different directions. The encounter resulted to the recovery from the NPA of two M16 armalite rifles, one M16 rifle with grenade launcher, ammunition and personal belongings. There was no reported casualty on the side of the government troops while undetermined on the enemy side. Maj. Gen. Jet B. Velarmino, Commander of the 8th Infantry Division lauded the officers and men of 19IB for the successful encounter against the NPAs operating in Carigara, Leyte. The 8ID chief further extended his appreciation to the peace-loving residents of Brgy. Parag-um for reporting the NPA presence in their community. “I would like to express my sincerest appreciation for the continued support of the communities in our quest for a lasting peace here in the Municipality of Carigara, Leyte. Small as it maybe, your timely information significantly led to the success of our effort in addressing the NPA threat in this part of the region. Rest assured that your Army here in Eastern Visayas will remain and will always be by your side as we pursue genuine peace, nation-building and development in this region”, says MGen. Velarmino. PASAY CITY – Senate Majority Leader Alan Peter “Companero” S. Cayetano is pushing for the relocation of some government departments outside Metro Manila not only to decongest cities in the capital region but more importantly, to boost economic development in the countryside. “If we want a long-term solution to decongest Metro Manila, the government must bring growth to the countryside. Kapag nag-economic planning tayo, dapat may national vision and coherent policy but there should also be 17 regional strategies. Bawat region, may strategy tapos paglalaanan ng pondo,” Cayetano said. “There are 19,137 Filipinos per square kilometer in Metro Manila, ganoon kadami ang tao dito. Ang pinakamalapit nang bilang ay sa Calabarzon, which only has 758 people per square meter. The rest, ang average is around 300 per square meter. Karamihan nasa Metro Manila na,” he noted. Cayetano proposed that the Departments of Agriculture, and Agrarian Reform be transferred to Central Luzon, the country's rice granary, while the Department of Transportation and Communications be moved to Cavite where the agency is eyeing to build a new airport, and the Department of Tourism to tourist haven Cebu in Central Visayas. He is also suggesting that the National Anti-Poverty Commission be relocated in Mindanao, which has some of the poorest provinces and municipalities in the entire country. “Metro Manila will continue to be the political and financial capital of the Philippines but this should not mean economic activity should be concentrated in the capital region,” Cayetano said. The senator is also pushing for similar health centers located in Metro Manila to be constructed in other regions across the country to provide wider access to health facilities and services, and promote employment among medical professionals. “Ang Lung Center natin, Kidney Center, Orthopedic Center lahat nasa Metro Manila. Kapag Ilocano ka, Zamboangeno, or Cebuano, pupunta ka pa sa Manila for that? Why can’t we build a Philippine Heart Center in Visayas or in Mindanao? So that ang mga doctors, may choice din na doon pumunta, and economic activity will grow,” Cayetano said. HEALING CLASSROOMS. In partnership with International Rescue Committee (IRC), the Ramon Aboitiz Foundation Inc. Dolores Aboitiz Children's Fund (RAFI-DACF) augmented its day care construction project with IRC's "Healing Classrooms" program, wherein teachers are trained to help children recover from crisis. IRC trains RAFI on disaster, emergency response mgt. CEBU CITY – Aside from donating to the relief and rehabilitation efforts of the Ramon Aboitiz Foundation Inc. (RAFI), worldwide humanitarian organization International Rescue Committee (IRC) has also started training RAFI in terms of emergency and disaster response management. The capacity building training focuses on emergency competencies, economic recovery programs, and team and stress management skills. Participants of the training program include those directly involved in the Super Typhoon Yolanda relief efforts. Last February, IRC also gave RAFI training on assessment and introductory module on emergency and disaster response and resilience. IRC, an organization formed at the behest of scientist Albert Einstein, and RAFI held their organizational development consultation last July 25 as part of the program on capacity building and development of emergency and disaster response procedures. Evelyn Nacario-Castro, Executive Director of the RAFI Eduardo Aboitiz Development Studies Center, said IRC is very supportive of what RAFI wants to do. “We see our partnership with RAFI as a way to know how disaster response works in the Philippines, in the same way we hope we can bring somebody around to be brave about emergencies,” IRC Emergency Preparedness Coordinator Christine Amy said. IRC also partnered with the RAFI-Dolores Aboitiz Children’s Fund (DACF) in the building of 20 disaster-resilient day care centers in the towns of Daanbantayan, Bantayan, Madridejos, and Santa Fe, Cebu. Of the 20 day care centers, 12 have been rehabilitated in Barangays Tinubdan, Dalingding, Pajo, and Bitoon in Daanbantayan; Barangays Oboob, Baigad, and Okoy in Bantayan; Barangays Poblacion, Kangyawan, and Kaongkod in Madridejos; and Barangays Poblacion and Maricaban in Santa Fe. The remaining eight are newly-constructed day care centers in Barangays Bateria, Malbago, Lanao, and Tapilon in Daanbantayan; Barangays Kampingganon and Sillon in Bantayan; and Barangays Balidbid and Okoy in Santa Fe. “The components of this day care center (program) are the ‘Healing Classrooms’ where skilled day care workers would work to identify trauma in children who experienced difficult traumatic experiences due to a disaster and help them develop their well-being,” IRC Emergency Field Director Suzanna Tkalec said. The Healing Classrooms program is an original IRC concept designed to train day care workers and teachers in using special techniques that would aid them in engaging traumatized children from devastated areas, and create a secure and nurturing learning environment for them. IRC started the program in 2004, working with more than 5,000 teachers and 400,000 students each year in countries like Afghanistan and Pakistan. IRC said families in these devastated lands lost loved ones, homes, and jobs, and the children often lacked the coping skills they need to move forward with their lives. "Since we want a holistic recovery for the Yolanda survivors, we do not only train the day care workers to help children cope, but we also teach them (day care workers) to heal themselves because they were also devastated by the typhoon," DACF Program Officer Jan Montilla said. Together with IRC, DACF trained 22 day care workers from 20 sitios and barangays in the four towns. IRC Consultant Trainer Patricia Giffoni and DACF facilitated a training series for the day care workers. The first training in July focused on methodologies and techniques that can be used in teaching children inside the “healing classrooms,” such as establishing routines on daily activities, and cold calling during recitals or discussions. The next training in August focused on the assessment of children, wherein the day care workers were trained how to craft participatory activities, such as games and group works, appropriate for a child's age and stage of development. Aside from ensuring the children’s recovery, these activities are also aimed to develop the seven domains of child development: gross and fine motor skills; expressive, receptive and cognitive languages; and self-help and spiritual development.